The cacao bean, the basis of cocoa and chocolate, is one of Mexico’s many culinary gifts to the world. Cacao beans come from the cacao tree (Theobroma cacao). The main area for cacao cultivation is the Gulf coast state of Tabasco, known for its cacao for over three thousand years, since Olmec times. Cacao became especially prominent in later centuries among the Maya in south-eastern Mexico and the Aztecs in central Mexico, playing a key role in indigenous culture and economy. Among Mexico’s indigenous peoples, cacao beans were ground by hand and then mixed with water, ground corn and chile pepper, often flavored with vanilla or some other tropical plant. This drink was known as chocolate. Fascinating Mexico Cooks! article about how cacao beans are turned into chocolate by a skilled artisan in Michoacán. Aztec emperor Moctezuma drank chocolate daily. The household of Nezahualcóyotl, the chieftain of neighboring Texcoco, consumed more than 20 kg (44 lbs) of cacao a day. Cacao beans were traded throughout the region and were an important item of tribute in the Aztec empire. Cacao beans were widely used in Middle America as a form of currency; cacao beans were accepted in many regions and could be traded for almost anything. For a fascinating, detailed, and meticulously referenced geographical analysis of cacao cultivation in pre-Columbian times, see “The Distribution of Cacao Cultivation in Pre-Columbian America” by John F. Bergmann (Annals of the Association of American Geographers, Vol. 59, 1969). Today, of course, cacao beans are used not only in the production of chocolates, but also for cacao-flavored liquor, cocoa butter and instant cocoa drinks. The south-eastern state of Tabasco currently accounts for around 70% of Mexican cacao production, with Chiapas adding 29% and Oaxaca and Guerrero 1% between them, though cacao trees are now cultivated as far north as Veracruz on the Gulf coast and Colima on the Pacific coast. Cacao trees grow up to 6 m high with leaves up to 30 cm (12 in) long. The trees flower from the trunk and older branches. Seed pods contain cacao seeds which look somewhat like almonds. Harvesting of the pod-like fruit (the cabosse) of the cacao tree runs from October to April each year. It is critical to choose the ripe pods and mature trees can be harvested several times each year. 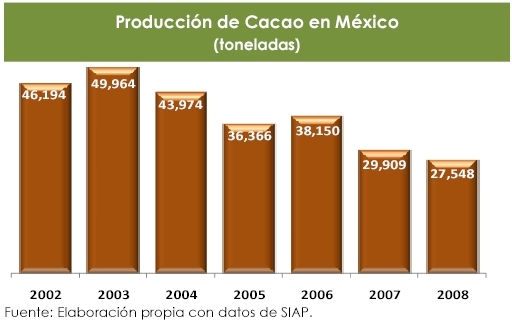 How much cacao does Mexico produce? In 2008, Mexico produced 27,548 metric tons of cacao. Production has fallen rapidly since 2003 (see graph above) when it was almost twice as high at 49,965 metric tons. The main reason for the drop in production is the low yield of cacao plantations, which has led many farmers to migrate away or choose alternative crops which have a greater profit potential. 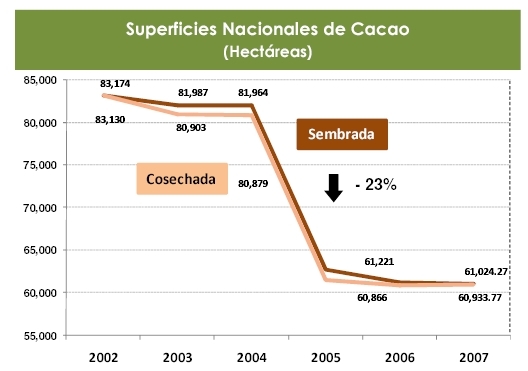 This is clearly indicated by the statistics for the area being used for cacao production which has also declined rapidly (see graph below) from about 82,000 hectares in 2003 to just 60,000 hectares in 2007. In any given year, less than 1% of this area suffers any form of climatic hazard that eliminates production. The average yield of cacao has risen by almost 8% a year in recent years to reach 578 kilos a hectare in 2007, as older and less productive trees are abandoned or replaced by other crops. Yields are higher than average in Guerrero and Oaxaca, about average in Tabasco, and well below average in Chiapas. Can Mexico’s decline in cacao production be reversed? More than 70% of the world’s cacao production is in Africa, with a further 16% in Asia and Oceania. Mexico currently produces only 0.01% of the world production of 4 million metric tons a year. In 2007, Mexico exported 160,000 metric tons of cacao and cacao-derived products. However, to meet the demands of the domestic chocolate industry, Mexico also has to import each year at least 40,000 metric tons of cacao and products derived from cacao. Consumption of cacao in Mexico has remained fairly steady at about 56,000 metric tons a year. The world demand for cacao is expected to increase by more than a million tons a year within the next 15 years, with strong demand from consumers in China, India and southern Asia. Europe is currently responsible for more than 40% of the world demand for cacao and its derivatives. Europe’s share of total world demand will fall dramatically in coming decades. Monografía del cacao. Financiera Rural, August 2009. BREAKING NEWS: Live interview with Geo-Mexico’s Dr. Richard Rhoda TODAY Will the mighty Colorado River ever reach its delta?